Whether you're looking for an activity for your preschool class or a kids' Halloween party, this free Frankenstein coloring page is sure to keep little hands entertained. Need even more fun Halloween printables? Check out our Haunted House Coloring Page and our Witch Coloring Page, too! 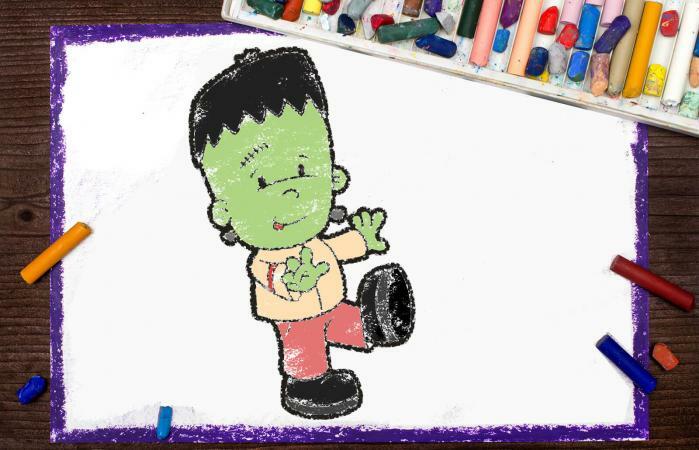 Frankenstein is usually scary, but not in this cute, friendly Frankenstein printable. Not only is he smiling at you, but he will make some great wall art. If you need help downloading the printable, check out these helpful tips. Frankenstein isn't the only monster to dominate Halloween. There are other Halloween art activities you can try too. Are you ready to have a monster mash? How about a graveyard smash? Either way, this fun haunted house coloring page can be a great way to spook up your house. Whether you just color it for fun or frame it as a decoration, it will be a monster of a good time. Another fun monster for Halloween is a good old witch. This cute friendly witch coloring page makes you want to smile while she rides her broom across the night sky. In addition to coloring the witch, kids can also decorate the background or cut her out. On this printable page, you can choose from a funny mummy staring up at you as he comes out the ground or you can even choose a cat mummy. These fun little coloring pages will make kids smile. Candy corn is a staple for Halloween. Evoke your sweet tooth through these fun printables. Once your kids complete their Frankenstein coloring pages, you don't want them to just throw them away. Repurposing your coloring pages can make a great use of your kid's creative side. If you have a lot of kids coloring the Frankenstein monster page, you can make gift bags from the pages to hand out candy to a classroom or trick or treater. The simple and easy way to do this is to laminate the pages, tape them into a bag and add handles with a hole punch and string. Voila, you have custom made candy bags. Make the coloring page into a bookmark. This can be super fun for kids and a great way to show their creative art. Just laminate the image and cut it into a rectangle. Use them to decorate the house for Halloween. You can tape them to the windows and put them on doors for a fun and spooky Halloween twist. Frankenstein and all his spooky friends are pretty much everywhere during October. Whether you want to keep kids busy or have handmade decorations, free coloring pages are a life saver. If you are looking for a few more coloring pages for kids, check out kids coloring pages and printables and coloring pages.